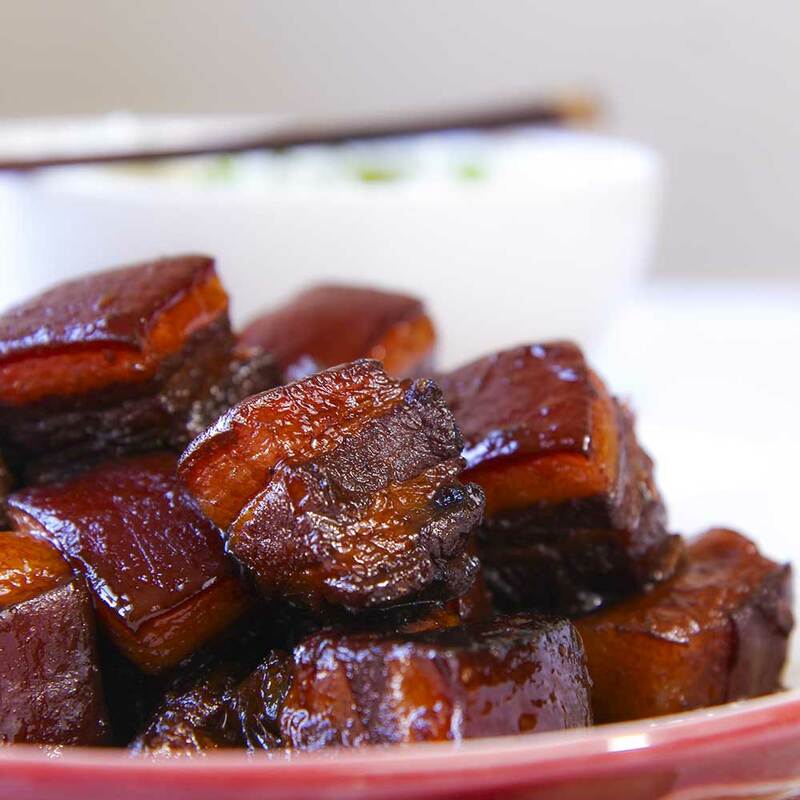 If it’s possible, prefer pork belly with skin as Chinese tradition wants. The skin combined with the sugar, will give at your stew more flavor, and the characteristic translucent effect. 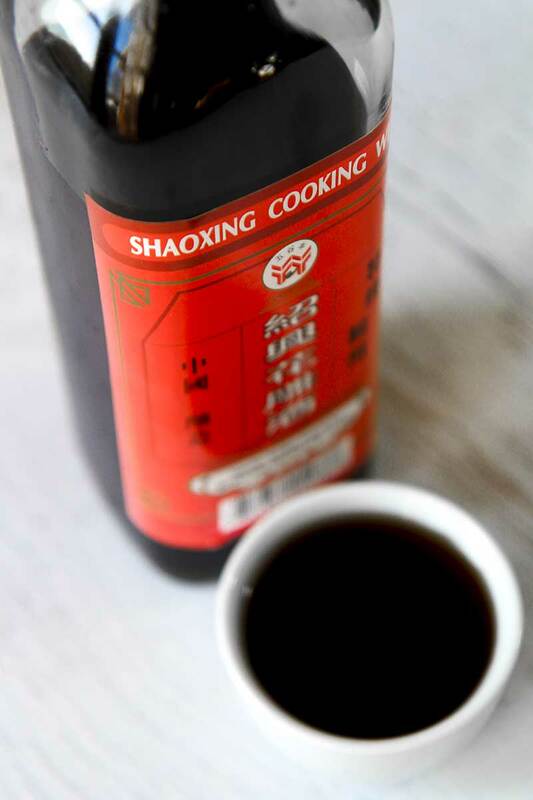 Shaoxing Chinese cooking wine is essential to obtain the authentic taste and color of the pork belly stew Shanghai style. 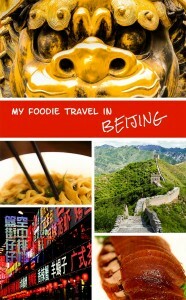 This wine is easy to find at the Asian shops and Markets. 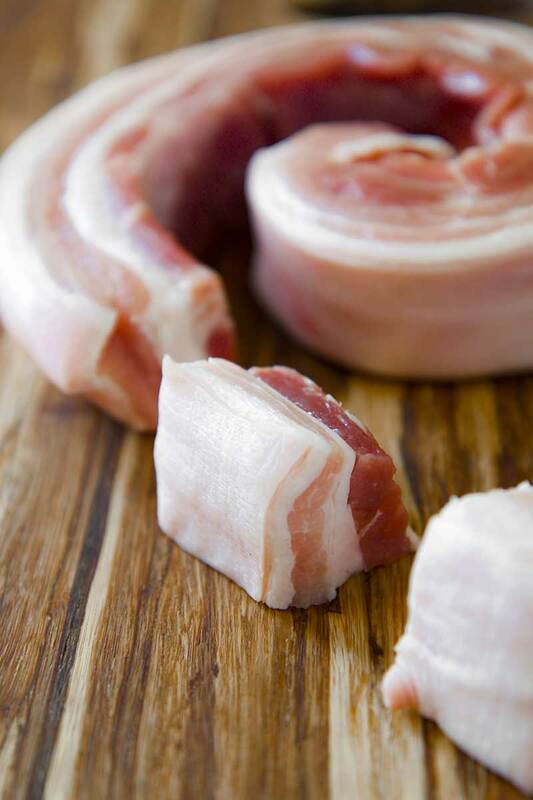 Cut the pork belly in strips large 1.5-2 inches, then dice the meat into big cubes. Pour the pork belly into boiling water and cook for 3 minutes, then drain and dry with paper towels. This process will remove any impurities and will tenderize the meat. 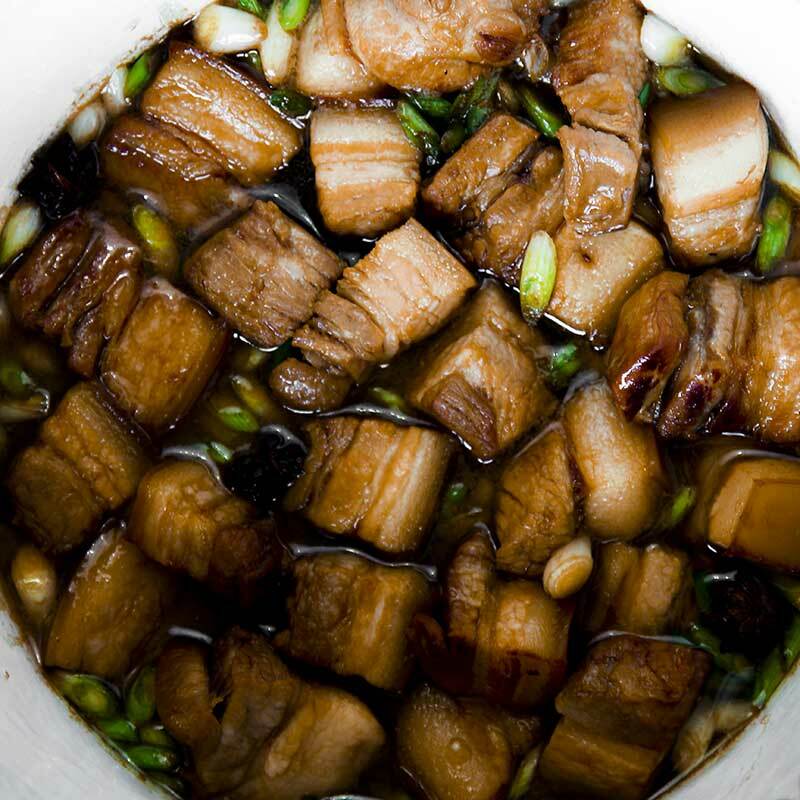 Pour the peanut oil combined with 4 tbsp of brown sugar into a wok or a pan big enough to contain the pork belly stew. Place the pan on medium/low heat. When the sugar is well melted, add the meat. 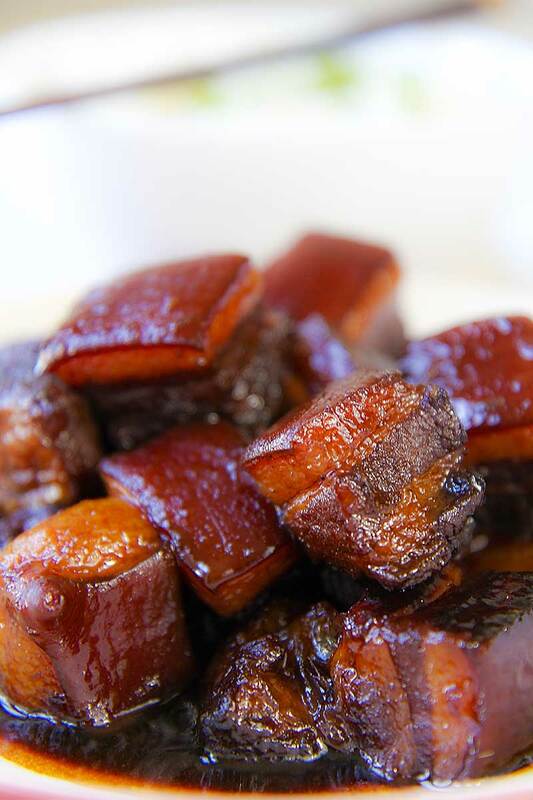 Caramelize the pork belly dices until golden brown, then add the Chinese wine and raise the flame. Cook for 5 minute stirring occasionally. Pour 2 tbsp of peanut oil into a thick-bottomed heavy pot. Cut the spring onions into slices thick 1/4 inch, and peel and crush the cloves of garlic. Slice also the fresh ginger into thin slices. When the oil is hot, but not smoking, stir-fry 5 minuts the vegetables combined with the star anice, and the clove, and the ginger slices. Now, pour the meat with wine and soy sauces into the pot. The liquid have to reach 3/4 the height of the meat pile, if not add hot vegetable broth. Cover the pot with a lid and set the heat in order to gently simmering the pork belly stew. Cook a couple of hours until the meat is extremely soft, but the fat stripes are not melted. When the pork belly stew is ready, drain the meat piece and place into a bowl covered with aluminum foil. Now, add 4 tbsp of sugar, raise the flame and bring the sauce to simmer until obtaining a thick sauce. Finally, pour again the the meat into the sauce, low the heat at minimum, and cook 15 minutes more. Serve the pork belly stew with white rice and stir-fried vegetables. The pork belly stew is great just cooked, but it is even better the day after! Just remember to warm it at very low flame, otherwise the meat will be a little gristly. Conserve the pork belly stew into the fridge up to 3 days. 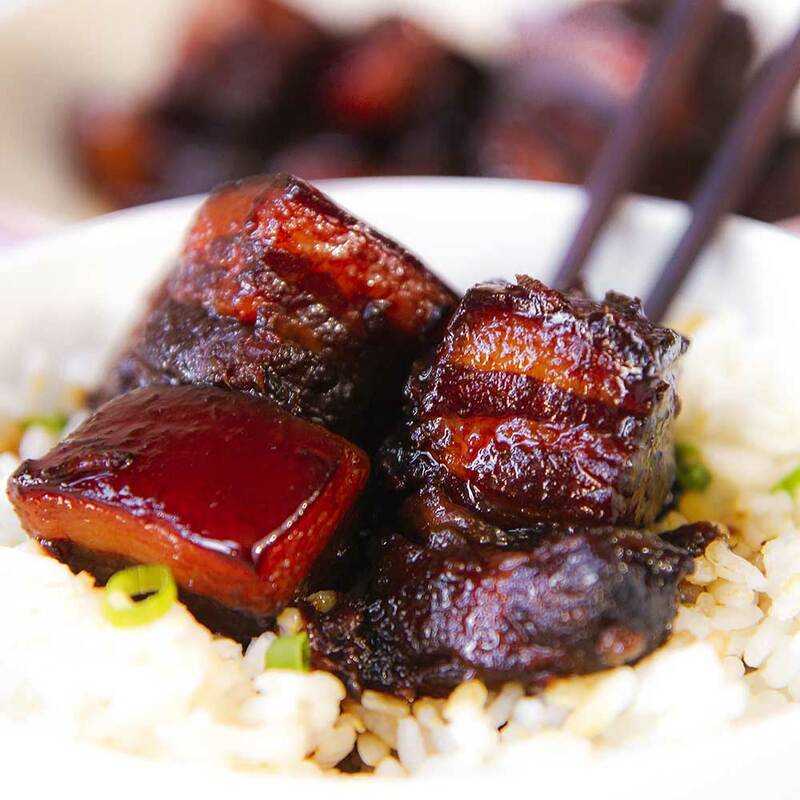 If it's possible, prefer pork belly with skin as Chinese tradition wants. The skin combined with the sugar, will give at your stew more flavor, and the characteristic translucent effect. Pour 2 tbsp of peanut oil into a thick-bottomed heavy pot. 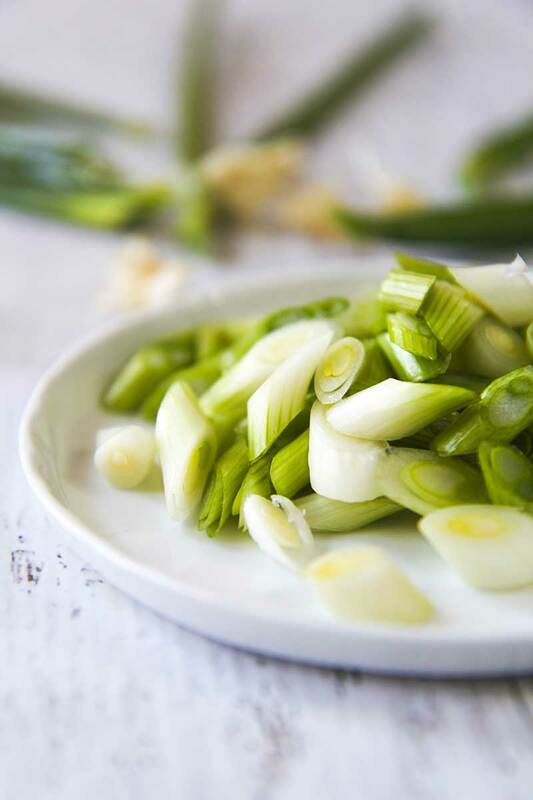 Cut the spring onions into slices thick ¼ inch, and peel and crush the cloves of garlic. Slice also the fresh ginger into thin slices. When the oil is hot, but not smoking, stir-fry 5 minuts the vegetables combined with the star anice, and the clove, and the ginger slices. Now, pour the meat with wine and soy sauces into the pot. The liquid have to reach ¾ the height of the meat pile, if not add hot vegetable broth. Cover the pot with a lid and set the heat in order to gently simmering the pork belly stew. Cook a couple of hours until the meat is extremely soft, but the fat stripes are not melted. When the pork belly stew is ready, drain the meat piece and place into a bowl covered with aluminum foil. Now, add 4 tbsp of sugar raise the flame and bring the sauce to simmer until obtaining a thick sauce. Finally, pour again the the meat into the sauce, low the heat at minimum, and cook 15 minutes more. What do I do with the other 8 tablespoons of sugar? Thanks for noticing Andy. There was a typo in the description, i just correct that! In the ingredients list, you have 4 cloves of garlic and then at the bottom you just say 2 cloves. Is that two more cloves of garlic? or is that a typo? 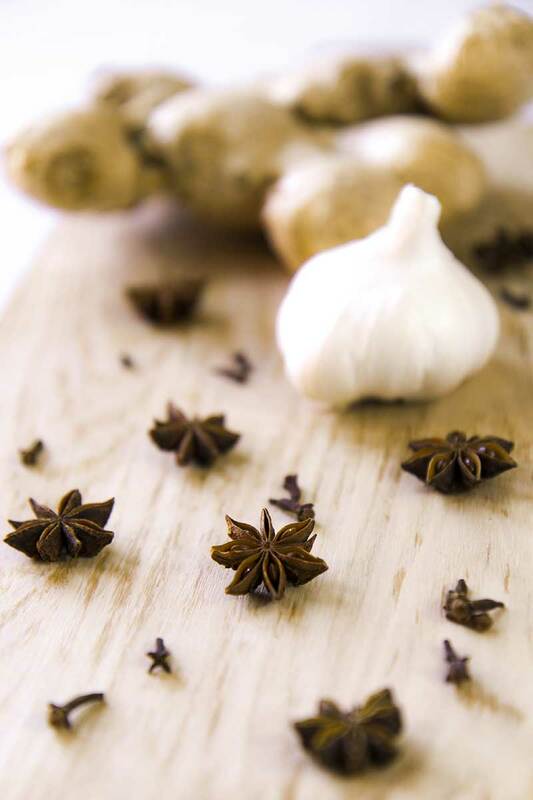 When I write just cloves or clove, I mean the spice. Looks delicious!! Going to try it for new year!